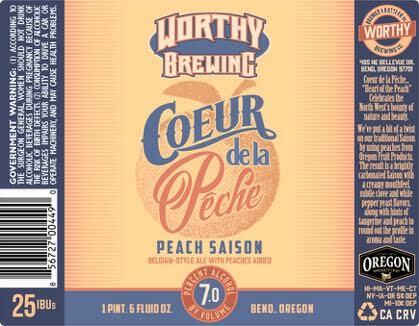 Bend, Oregon - 22 June 2016 - To celebrate the warmer months, Worthy Brewing is releasing two fruit-focused summer seasonals with real fruit purees from Oregon Fruit Products. 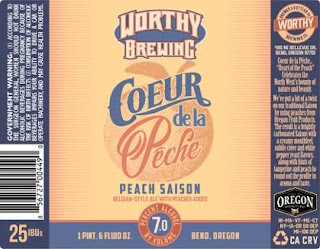 Coeur de la Peche (or Heart of the Peach) is part of a new seasonal saison series that also includes their classic Farm Out Saison. The brew uses apricot and peach purees and the result is a brightly carbonated brew with a creamy mouthfeel and subtle clove and white pepper yeast flavors. Hints of peach and dried apricots round out the profile in aroma and taste. Coeur de la Peche is available in 22-ounce bottles and on draft through September. Kama Citrus IPA is a well-balanced blend of Centennial and Equinox hops, with the addition of real Mandarin orange and grapefruit purees. It’s clean and crisp with a juicy citrus flavor and fresh tangerine on the nose. A pronounced hoppiness and balanced profile combined with a 6.2% ABV might just make this the perfect summer IPA. 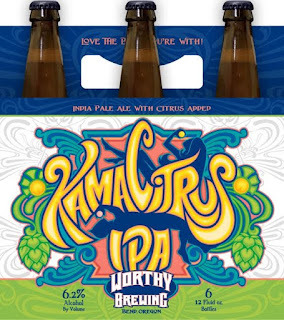 Kama Citrus IPA is available in six-pack 12-ounce bottles and on draft through October. Worthy Brewing Company’s flagship beers include 12-ounce cans of: Worthy IPA, Prefunk Pale Ale, Easy Day Kolsch, and Lights Out Stout. The bottling line also cranks out 22-ounce bottles of Worthy IPA, Worthy Imperial IPA and Eruption Imperial Red Ale, along with limited releases of specialty and seasonal beers, such as Coeur de la Peche and Kama Citrus IPA.